Bee swarms happen all over the nation, including in Palm Beach, Florida. They are more common during the spring months, although occasional swarms can happen during other seasons as well. After the swarm occurs, the scout bees in the colony will settle several hundred feet from the nest and look for a site to set up a new nest. 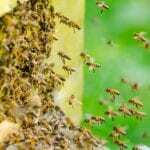 If you spot bee swarms taking place on your property, you could end up with a serious bee infestation that could create a dangerous situation for you and your family members.